Our 4-Year-Old/VPK Preschool provides a rich environment where students are encouraged to explore and challenged to learn. Our preschoolers will make new friends and grow in self-confidence as they develop reading and writing skills and are introduced to important literary concepts, math skills and social skills. Within our warm and nurturing environment, children are taught from a biblical world-view by highly qualified and caring staff. Physical development and imagination are enhanced through many opportunities for creative play, hands-on learning and social development. Our preschool program is certified by the Florida League of Christian Schools. Read more about the teachers, grades and courses in our VPK. Students in our free VPK program are required to attend Monday – Wednesday from 8:30 a.m.-1:45 p.m. We offer a Wraparound Program from 1:45 p.m.-3:15 p.m. for a fee. Our 4-year-old students that do not have a VPK voucher are required to attend Monday-Wednesday 8:30 a.m.-3:15 p.m.. 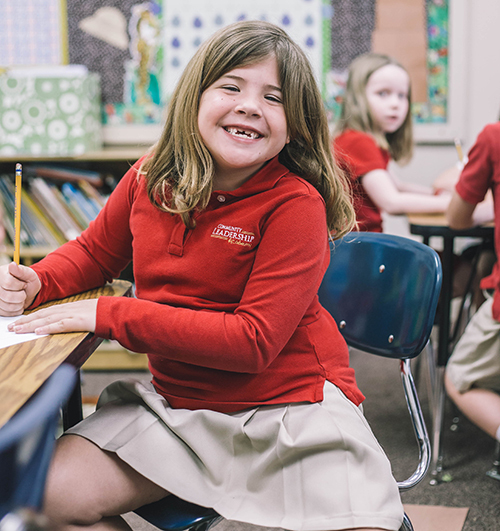 They enjoy all the benefits of a private Christian school: the advanced academic curriculum, the structure of the classroom environment, the socialization of their peers and a staff that goes the extra mile to be sure every student grasps the moral, academic and practical education. They have Art, Music, Physical Education/Health and occasionally participate in a larger group production or event. They also benefit from another whole aspect of school: their parents. It’s true that parents can be involved in their children’s educational experience in any school they choose, but at CLA the parents are not only accountable to be involved, they are part of the curriculum. On Thursday and Friday of each week, students in our 3-Day (M-W) Program are taught by their parents from a lesson plan prepared by the student’s teacher at CLA. This way, the academy and the parents are always cooperating and understand exactly where the student is in their instruction. Students will show a greater interest and enthusiasm in their schooling and have a better attitude toward adults. We believe this is possible, because their education is not just a “compartment” of their life confined to a building, but a very real experience that is reinforced by many adults who care for them. If you are interested in attending school on Thursday and/or Friday, please see our Full Week Program page for more information. Please see the Tuition and Fee Schedule for pricing. Parents are responsible for their children’s education in a very real way. If their children are not enrolled in the Full Week Program, they teach their children on Thursday and Friday from a prepared lesson plan and are responsible for making sure all school assignments and activities are turned in on time. The experience for parents is a spiritual and emotional journey. It is part of our right and our responsibility to be able to play a greater part in our children’s spiritual and academic education, and a blessing to be able to have such great support in the moral training of our children. The parent experience is a blessed one. Students who are only enrolled in the free VPK Program (M-W 8:30 a.m.-1:45 p.m.) are not required to wear the designated uniform for Lower and Middle School however, students who are enrolled in the Wraparound Program (M-W 1:45 p.m.-3:15 p.m.) are required to wear a uniform. Students may choose from khaki or navy uniform line bottoms paired with red, yellow or white tops with the CLA logo. An item labeled uniform line maintains traditional colors, cuts and lengths considered appropriate for many school dress codes. Tops must be purchased at the approved sources only. The Family Handbook is the best place to find all CLA policies in detail.